Raikisan! 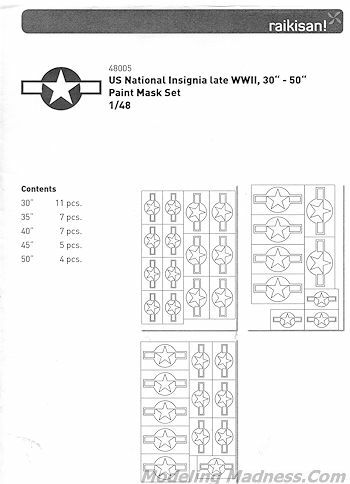 Productions A 48005: 1/48 US National Insignia, Late WWII 30" - 50"
A growing trend among modelers is that of using paint masks for insignia. This is not new, but the truth is that no decal can match paint. Many of us us paint for things like bands and stripes so the addition of doing insignia is just another feature we can add to our skill set. Raikisan! Products is a relatively new company out of Austria that has a nice selection of US and RAF national insignia as well as a number of 1/35 Allied vehicle stars. They sent in one of their more popular sets that covers late war US national insignia. The set comes with a variety of sizes that includes 11 30" insignia, 7 35", 7 40", 5 45" and 4 50" insignia. Each of these works the same. One first takes the rectangular outside mask and puts in it place. Then the area surrounding this mask is further masked off to prevent overspray. The inside of the mask is then painted white. Following that, the other three parts of the mask are installed and when all is aligned, the area to be painted insignia blue is then removed and that area painted. Then all is taken away and you have a painted on insignia. For those wishing to duplicate the 'greyed out' insignia that some aircraft wore, simply spray the grey instead of the white. These are available in both 1/48 and 1/32 scale. I would show you the masks proper, but all you would see is a yellow rectangle so the cover illustration should provide you a good idea of what you get in each set. These are very nicely done and should be easy enough for just about anyone who wishes to give these a go. Thank you to www.raikisan.at for the review set. See this and their other offerings at the link. If you would like your product reviewed fairly and fairly quicklyh, please contact the editor or see other details in the Note to Contributors.